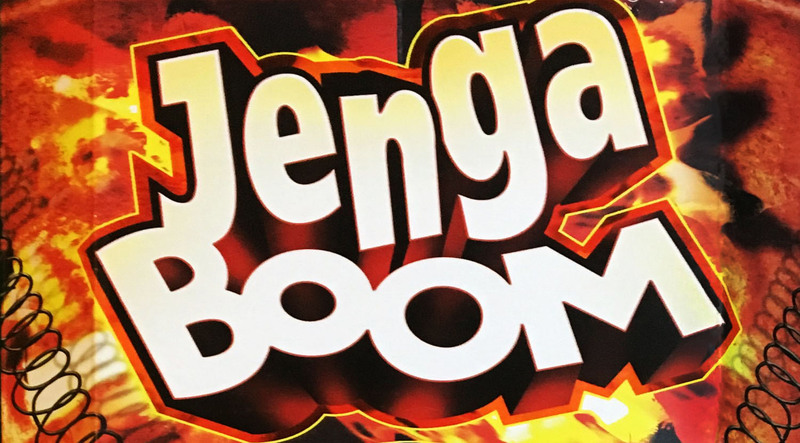 Published by: (Unknown), Barnes & Noble, Borras Plana S.A.
Jenga is played with 54 wooden blocks; each block is 3 times as long as it is wide, and slightly smaller in height than in width. The blocks are stacked in a tower formation; each story is three blocks placed adjacent to each other along their long side, and each story is placed perpendicular to the previous (so, for example, if the blocks in the first story are pointing north-south, the second story blocks will point east-west). There are therefore 18 stories to the Jenga tower. Since stacking the blocks neatly can be tedious, a plastic loading tray is included. Once the tower is built, the person who built the tower moves first. 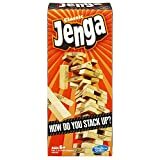 Moving in Jenga consists of taking one and only one block from any story except the completed top story of the tower at the time of the turn, and placing it on the topmost story in order to complete it. Only one hand at a time may be used to remove a block; both hands can be used, but only one hand may be on the tower at a time. Blocks may be bumped to find a loose block that will not disturb the rest of the tower. Any block that is moved out of place may be left out of place if it is determined that it will knock the tower over if it is removed. The turn ends when the next person to move touches the tower, although he or she can wait 10 seconds before moving for the previous turn to end if they believe the tower will fall in that time. 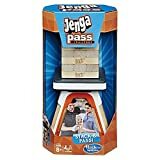 The game ends when the tower falls in any significant way -- in other words, any piece falls from the tower, other than the piece being knocked out to move to the top. The loser is the person who made the tower fall (i.e. whose turn it was when the tower fell); the winner is the person who moved before the loser. Remove one block at a time from the tower, and then stack it on top. The last player to stack a block without making the tower fall wins the game! Empty the blocks onto a flat surface. Play alone for practice! Can you top your record height before the tower falls? Carefully remove one block from any level. Use a steady hand to stack It on top. Continue to remove and stack blocks to build the tower taller... and shakier. How tall is too tall? Find out when the tower falls! A set of poker ships. All players set up the tower together by stacking the blocks. 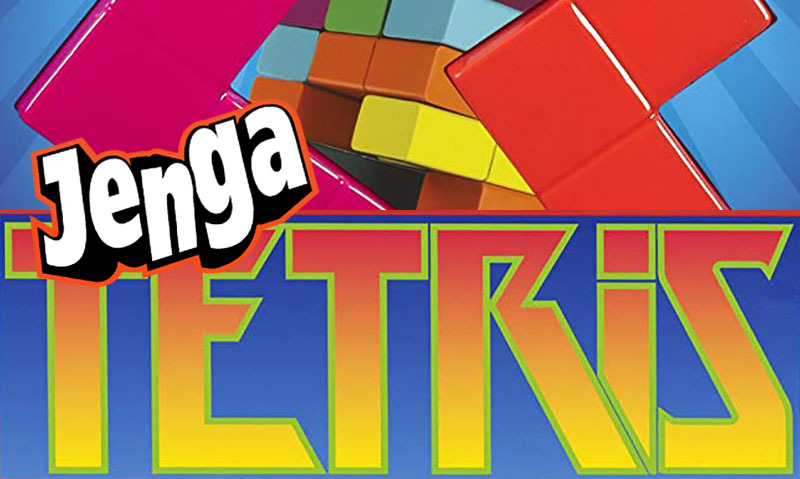 Don't worry if there are gaps, In Jenga TETRIS, gaps are okay! Its the classic game of Jenga with a new twist! Caretully pick out blocks and stack them up one by one... without toppling the tower! The easiest block might be a red one, but then you'll have to do a Dare. Change your mind and pick a green? Then you'll have to tell the Truth! Even the plain blocks could surprise you with a new challenge. So choose carefully and keep those wits about you. If playing the game without any modifications, the detonator/timer can be startling to individual(s) that do not not like loud noises and/or have a heart condition. If playing on the floor, ensure area is clean and free of debris and/or objects that could injure individual(s). Remove one block at a time from the tower, and then stack it on top of the tower to create a new layer. The last player to stack a block without making the tower fall wins the game. Throw 'n Go Jenga, the 80's hit, is back with the same great play and hot new colors! 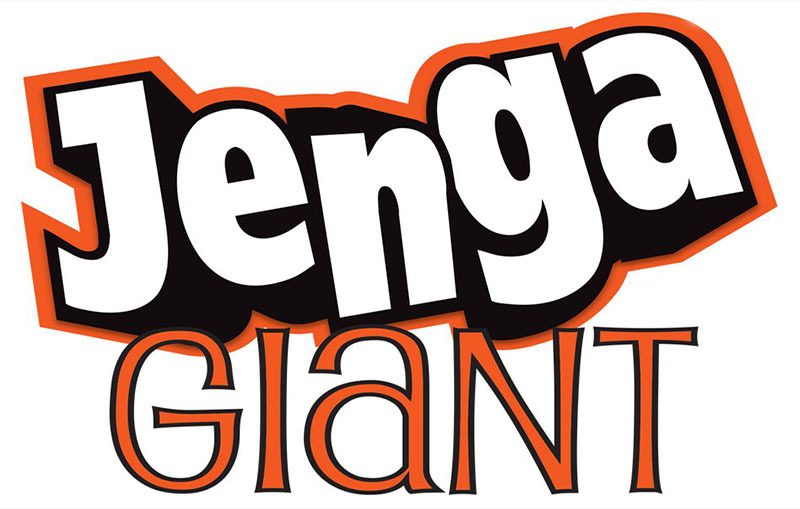 Gameplay is classic Jenga block stacking fun - with a colorful twist! 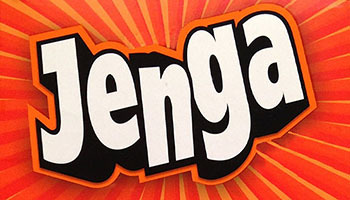 Players roll the die to determine which block they need to remove from the Jenga tower. When the tower gets "tippy" you could luck out and roll a Reverse to send play back to the last player. Things will get tricky fast. The tumble tower set comprises of 51 wooden blocks that is built into a tower. The aim of the game is to dismantle the tumble tower and rebuild it without losing any of the blocks or causing the tumble tower to topple over in the process. Any number of players can join in a game of tumble tower and it can also be played alone.